Each edition of the five-part Art on Film/Film on Art anthology explores a single theme in the creation of art using the medium of film. Each volume includes three short productions commissioned by the Program for Art on Film as well as insightful commentary and conversations from film experts and expert filmmakers. 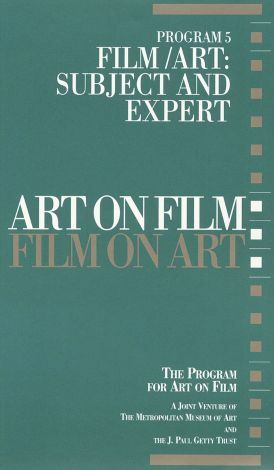 Program 5 -- Film/Art: Subject and Expert, the final piece in this illuminating anthology, explores the strengths and weaknesses involved in the use of an onscreen art expert. The three productions included with this 100-minute (nearly double the length of the preceding editions) video are: A Day on the Grand Canal with the Emperor of China by P. Haas and D. Hockney; Gombrich Themes: Illumination by Judy Marle and Sir Ernst Gombrich; and Gombrich Themes: Reflection by Judy Marle and Sir Ernst Gombrich.